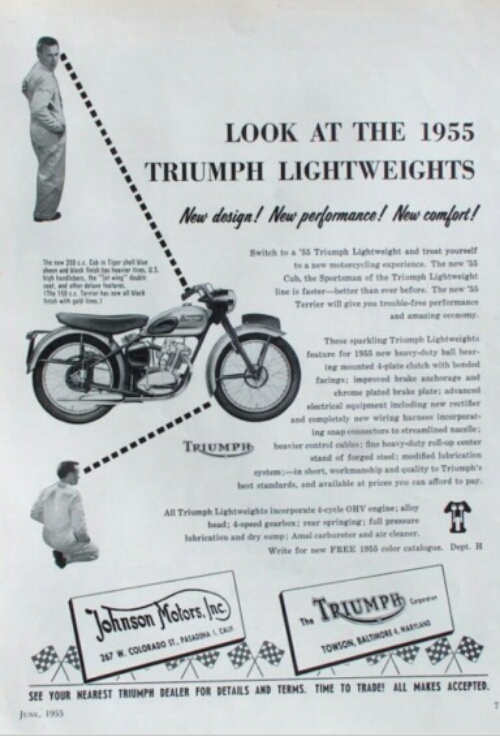 A right looker it appears: selling the nimble featherweight attribute of the diminutive Cub in the mid fifties. This must have looked quite sharp for its day. Sage advice indeed. Your body and mind can be trained to accomplish; but to feel the inner success of the achievement you need at least a modicum of heart. A vital spark of live that makes fulfillment true. 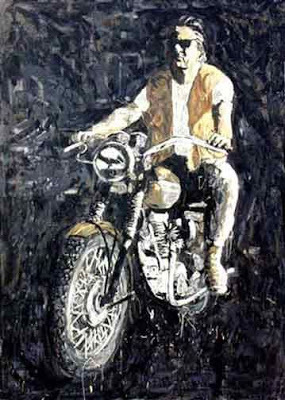 A found interweb painting of some Triumph rider and his steed. An appearance of emerging from shadow into the sunlight. 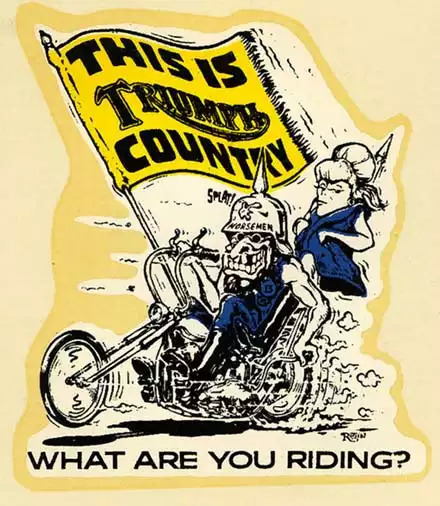 The feeling one gets when taking off down the road. 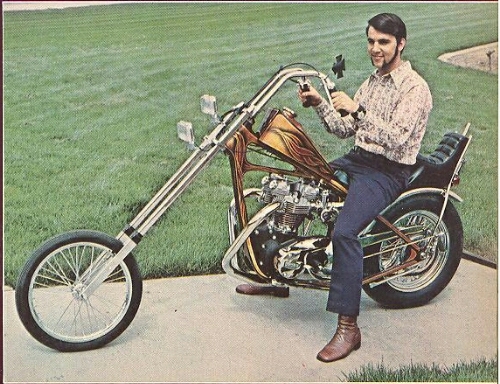 One thing that was seen a lot of in the sixties and seventies across America was chopped and stretched Triumphs. 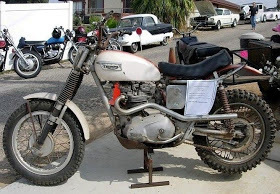 Hardtail rear, looong fork tubes, no front brake, perched pillion seat…. Erm! 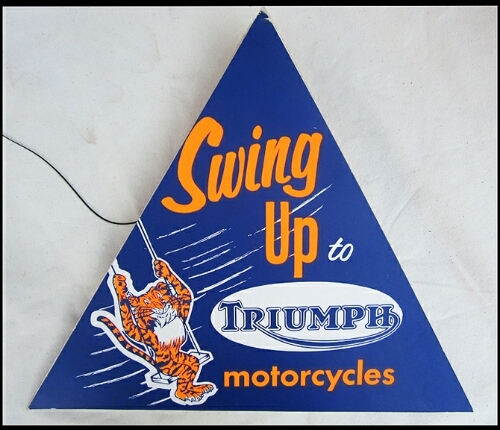 Back in the fifties and sixties this was the case! The agile powerful motos from the motherland came and conquered. On road, track and trail they chewed ’em up and spat ’em out in the dust behind. What tea party? Get the kettle on! 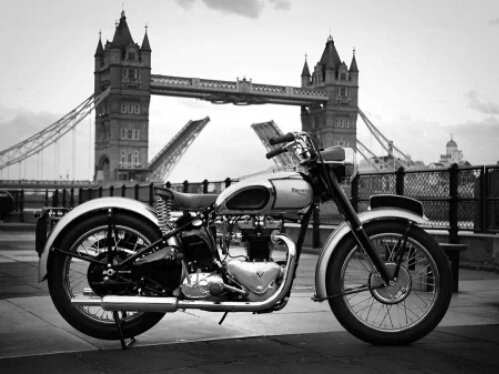 When I lived in London in the nineties part of my daily commute on either bicycle or motorbike was over Tower Bridge. An exciting section to speed over especially being at the front of the queue waiting for the bascules to be lowered. Indeed the one time I experienced a snowfall was on Tower Bridge. A Tiger gettin’ ‘hacky dorty in the mud. For effect only I’m sure; especially when the chrome is still shiny. 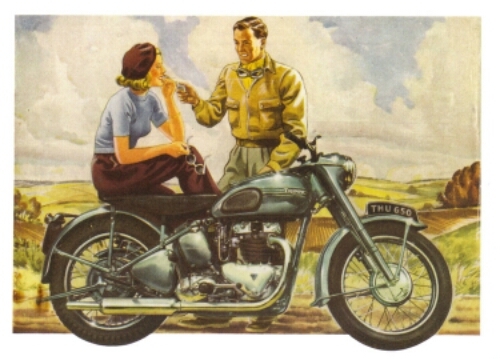 Git yer wellies on and gan doon t’the scramblin’ field and howk away at the clarty ruts wi’ yer knobblies. 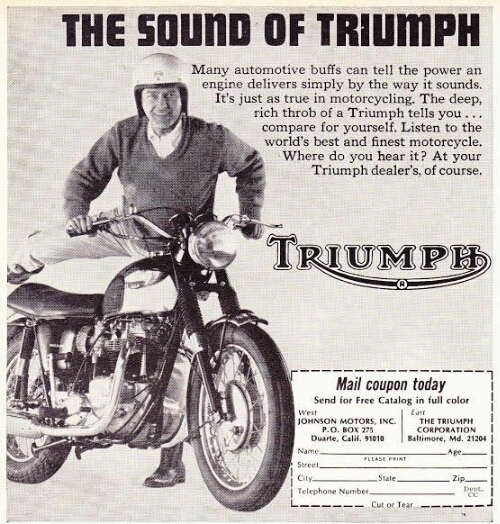 A magical note from the twin cylinder when revs rise from a lumpy burble to a high raspy whirr. When the engine is purring and the lanes smooth and clear it’s a beautiful song. A symphony of orchestrated parts moving in unison. 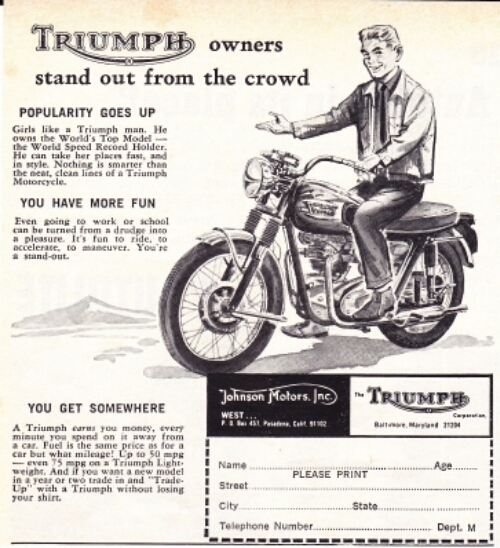 …are NOT suitable garb for sitting pillionward aboard a Triumph! 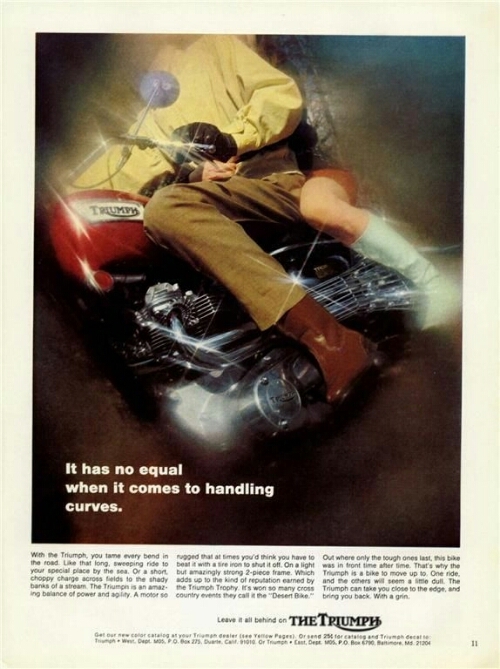 And what curves are they referring to? 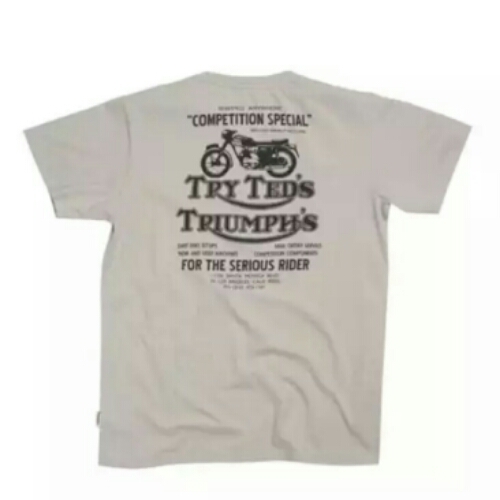 Just have a read of the adventuresome lifestyle a Triumph owner would experience by riding the legend British twin. James Bond comes to mind! Plenty of scantily clad gals as well as: skydiving, rapids in a kayak martial arts, deep sea fishing. 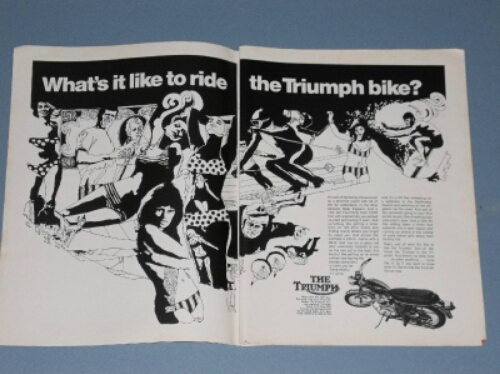 Quite outlandish: but that’s how the sixties and seventies must have been like. 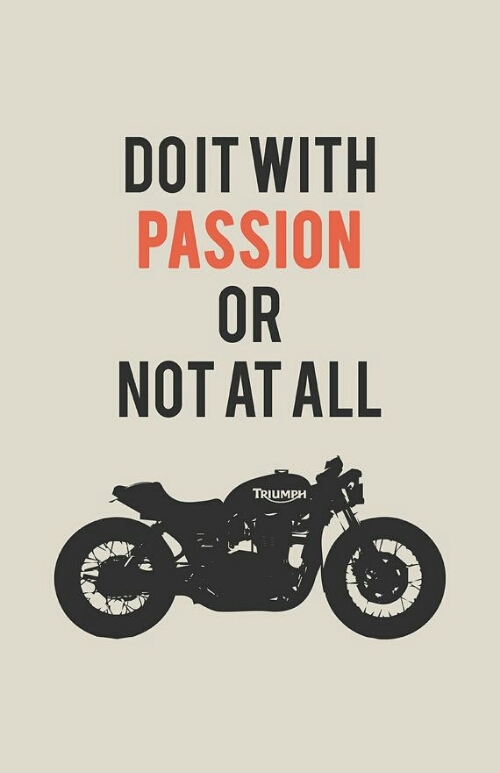 This is where motorcycling really comes into itself. 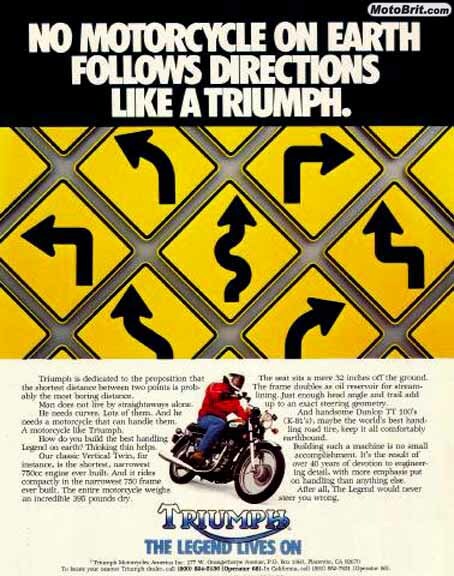 The road with curves, bends, esses, right handers, sharp left turns, chicanes, swoopers, and all corners where destination isn’t important. 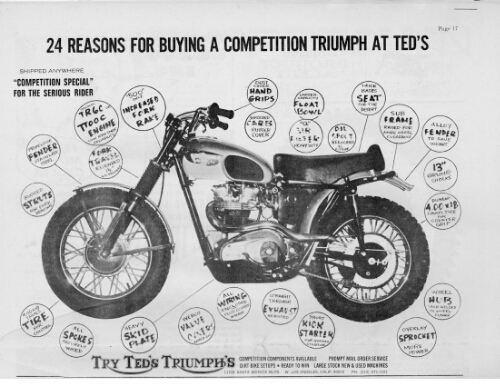 A poster with all necessary upgrades for your desert sled from some moto magician Edward in SoCal. What a machine! Its period precision for arid adventures. 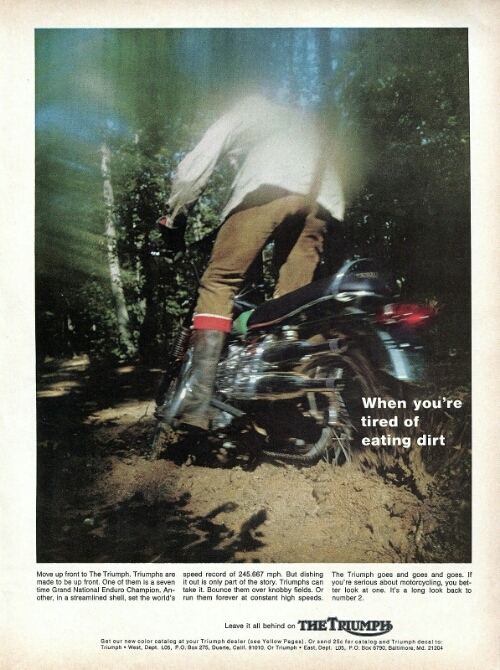 A mag strip ad promoting machines for the ‘serious’ rider. Here’s a couple of old lads looking like they were sand bled for a few thousand miles: one in original wear, another spruced up somewhat. 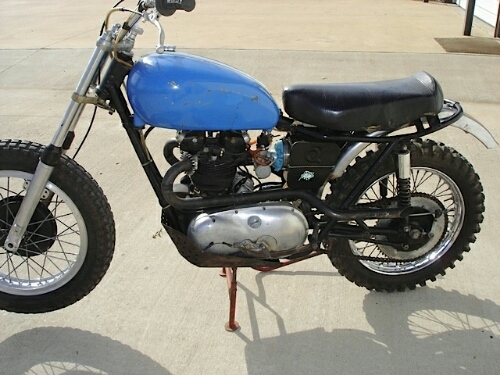 High pipes, q filter, knobbly tires, thick seat. Ted setup, or something inspired by that! 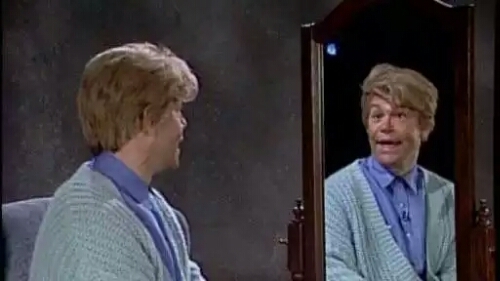 By the T-shirt if you can!